With unique subject matter and a bit of creative license, Director Jay Roach (Trumbo) brings us a captivating story that both enrages us and draws us in simultaneously. The Sixties were a tumultuous time in this country. Civil rights protests and the subsequent violent aftermaths popped up all over the south. The Vietnam conflict escalated overseas and President John F. Kennedy was assassinated in Dallas. Vice President Lyndon B. Johnson was sworn in as our 36th President and inherited one large mess. Johnson's first year as president was depicted in the Tony award winning play All the Way which was then turned into a movie for HBO films earlier this year. 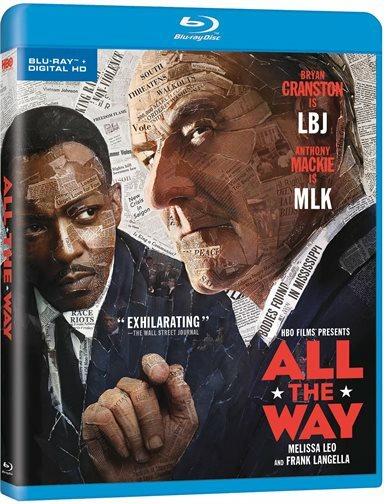 Starring Brian Cranston (Breaking Bad) who reprised his Tony award-winning role for the film, it begins with Kennedy's assassination and ends with Johnson's Election. The play and movie both chronicle the "accidental President's" time in the white house for his first 365 days. At the same time, the Vietnam Conflict was becoming hard to ignore as the United States tripled our troops overseas. All of this occurred while Johnson was actively fighting to win the 1965 election for the position he already held. Feeling threatened and road blocked at every turn, Johnson fought some hard earned battles while alternately displaying a sweet southern demeanor with a hard as nails persona. Cranston is masterful as President Johnson and it is easy to see why he won the Tony award for his performance on Broadway. Mackie is equally as dynamic as the iconic Civil Rights leader but doesn't quite capture his charisma. Surrounding them is an excellent cast including Bradley Whitford (The West Wing) as Hubert Humphrey, Frank Langella (The Americans) as Senator Richard Russell and Melissa Leo (Wayward Pines) as Lady Bird Johnson. The Blu-ray video is 1080p HD quality with a 1.78:1 aspect ratio. The clarity is so strong that the audience can make out Cranston's make up (but not his prosthesis) on the extreme close up shots. The audio is DTS-HD Master 5.1 and is mixed well in this film. The riot and convention scenes are just loud enough without being distorted and the quieter moments can still be heard without any volume adjustments. The disc offers two extras. The first entitled Brian Cranston Becoming LBJ is an interesting, yet brief, look at how Cranston is physically transformed into LBJ, including the aforementioned prosthesis and hair thinning. The second feature is All the Way: A Walk Through History in which various cast and crew discuss the events that took place in the 1960's. From the film, we get the impression that LBJ was an outwardly simple country guy, yet underneath, he was a very complex man full of emotions, ranging from empathy to almost violent rage and a fist full of insecurity. We also see numerous factors and individuals conspiring against the President at every turn, which makes for a compelling story. With unique subject matter and a bit of creative license, Director Jay Roach (Trumbo) brings us a captivating story that both enrages us and draws us in simultaneously. He plays to our emotions, and, along with his creative team (makeup, wardrobe, props), transports us to a bygone era when separate but equal no longer was acceptable. The film is a brief glimpse into the world of LBJ and his thoughts and feelings during that first year in office. It is well written, well acted and well directed and is worthy of the over 2-hour running time. For a glimpse into one of the more shameful eras in this country's checkered past, this movie gives us a brief view of what it was like to be the most powerful man in the world. Nominated for 8 Emmy awards, it is worth viewing at least once. Download All the Way from the iTunes Store in Digial HD. For more information about All the Way visit the FlickDirect Movie Database.